East Fife's Brett Long and Craig Watson. Pic by Kenny Mackay. 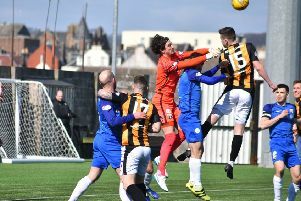 East Fife’s Craig Watson hails keeper’s Scottish Cup sav Craig Watson has hailed a late save by Fife goalkeeper Brett Long in Saturday’s Scottish Cup tie as among the best he’s ever witnessed. With the clock ticking down at Bayview and East Fife on their way to a 2-1 win over Greenock Morton, Long pulled off a remarkable close range, reaction save after a Charlie Telfer free-kick was nodded towards goal by Gregor Buchanan. It kept the Fifers ahead and they would go on to close out the rest of the cup tie. Watson was under no illusion at how crucial Long’s stop was. He said: “It was an unbelievable save. “I said it to Brett himself, that’s the best save I’ve seen in a game. “It’s was an unbelievable reflex save; superb. “We wouldn’t have won the game without him so credit to him, it was just as important as a goal. The victory set up a last 16 tie with Partick Thistle after East Fife knocked yet another Championship side out of cup competition during an impressive campaign. “It’s all down to what we do in training,” said the Fife defender. “We put the hard work in and it’s paying off. “We’re third in the league and still in a few cups. “It’s all good and positive and the lads are really happy about it. “The wins are all as good as each other but for me getting the goal makes it a bit more special.